If you stumble across an orphaned or abandoned baby chipmunk, it will require help to survive. Before scooping up the baby and taking him home, wait at least two to three hours to see if there are any signs of his mother. Place a warm water bottle under him to keep him warm while waiting. If his mother does not show up, take the baby home. Check the area for seven days after to see if there are any siblings who also may need care. Orphaned or abandoned baby chipmunks most likely will be dehydrated and chilled. Help the chip get comfortable at once. Put him in a warm room with no draft. You can place the chipmunk under a 100 watt bulb for extra heat. Use a thermometer to make sure the environment is no more than 90 degrees but not less than 75 degrees. Select a liquid to help your chip rehydrate. Pedialyte for infants is a good option. Fill a syringe with 1 cc. Offer it to your chipmunk every two hours. Purchase the puppy replacement formula, Esbilac to feed your chips. Other animal milk replacers and cow milk could cause death. To properly care for your chipmunk, determine his age. Chipmunks who are 1 week old will be hairless, have closed eyes and be 1.5 to 2 inches long. By 2 to 3 weeks old, you will be able to see hair, although the eyes will not be open. Newborn chipmunks should be fed 1 to 2 ml of formula six times a day. By 2 weeks of age, feed 2 to 3 ml five times daily. Keep the chips in a cardboard box or basket lined with towels or soft linen. Avoid using newspaper as bedding since the ink is toxic. Change bedding twice daily. Your chipmunk's eyes and ears will open by 4 weeks of age. At this stage, provide 3 to 4 ml of formula four times per day. By five weeks you can start supplementing with tiny pieces of fruit, such as apples, grapes and bananas. Introduce your chip to rodent chow as well. At this stage, your chipmunk will become more active. House your chip in a plastic pet carrier instead of a cardboard box as he will be able to chew his way out of a box. Supply your chip with twigs to teethe on. By 6 weeks old, only give formula twice a day. Add sunflower seeds, peanuts and veggies to his existing diet. 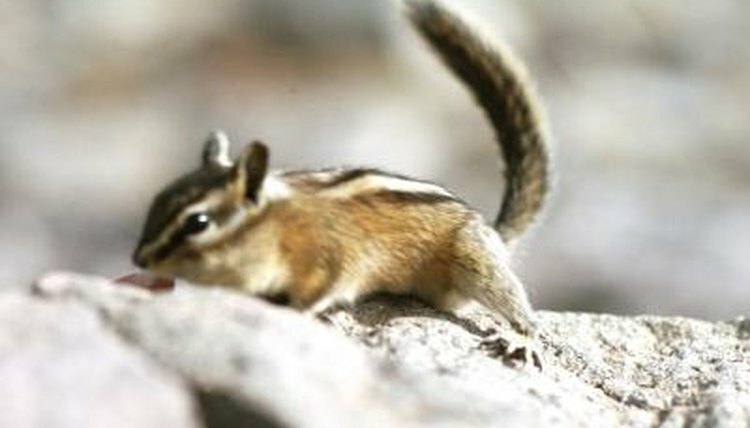 By 7 or 8 weeks your chipmunk will have a full, thick coat and be extremely active. Place him in a cage that is 2 by 4 by 4 feet. He should be weaned off formula. His diet should consist of 15 percent rodent chow; 50 percent nuts and 35 percent fruits and veggies. Once he is 9 or 10 weeks of age, your chipmunk is independent and strong enough to be released in the wild. At What Age Can Mice Start Eating Solids?